Believe it or not, I used to be so into makeup that I wanted to be a makeup artist. I wore it every day, had a job selling it (at The Body Shop), and spent way more money on it than I should have. I was as into makeup then as I am into polish now. Lots of things happened over the decade-ish since and I've been waiting for something to slap me in the face and revive my love and interest. I think it may have happened. I'm in awe and dreaming of lipstick again! 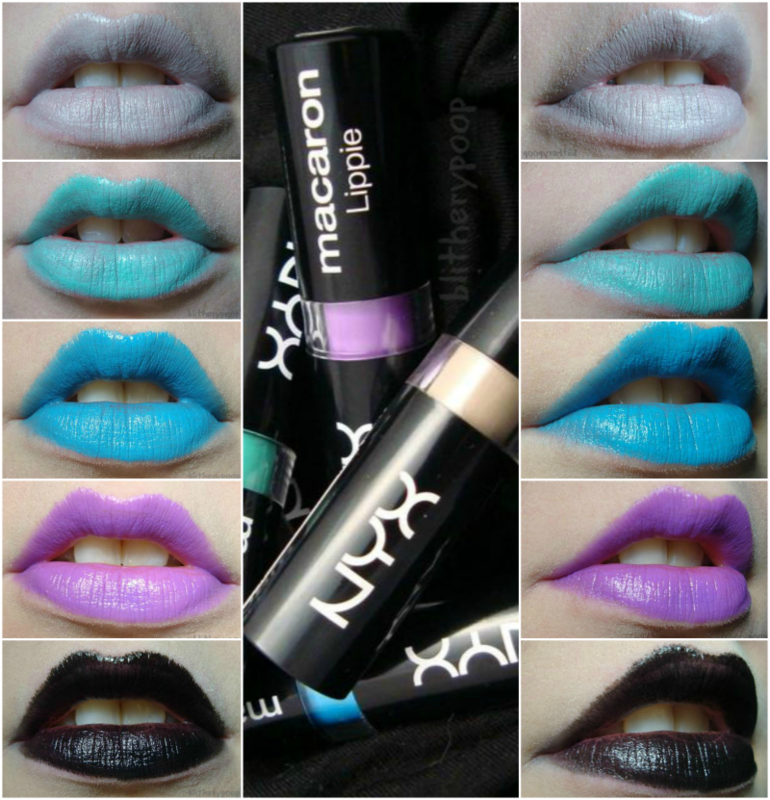 I knew I wanted some of NYX's new Macaron Lippies since their sneak peek on IG what feels like forever ago. I practically screamed when G. of Nouveau Cheap announced that they were fiiiiiinally available. I scurried over and wound up buying five of them. It's been mentioned in every single review, I know, but Black Sesame has a thin skin of a warmer gray on the outside. Once that's off (I gave it a quick swipe on my hand), the actual color is very neutral. I'm not sure if I'll be able to actually wear this, since it kinda makes my lips vanish against my skin, but I'm so impressed by the formula! It looks like it should be chalky as hell...but it isn't! The darker colors do feel smoother and creamier, but even this super-light shade feels good on. No scent either. 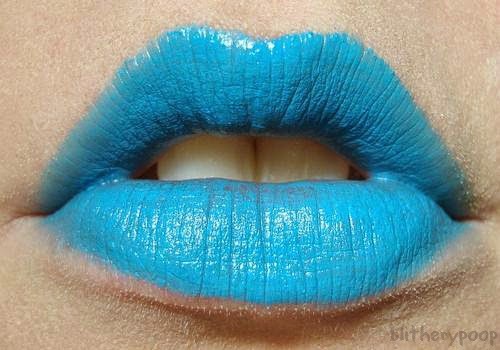 This is revolutionary for unusual colors from an affordable brand! 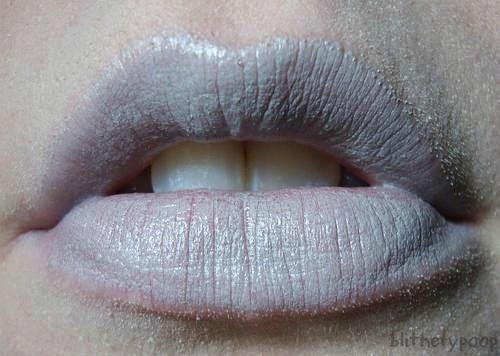 I would have sold my soul for lipsticks like this when I was fifteen! The impact and color payoff of Pistachio blew me away! 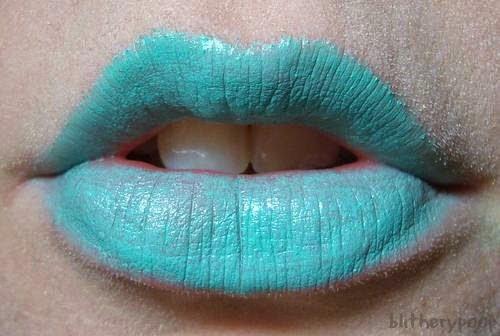 This minty color is intense and so very mid-Sixties. It makes me want to do crazy and experimental things and toy with super-retro looks. Like Black Sesame, it feels surprisingly non-awful on. 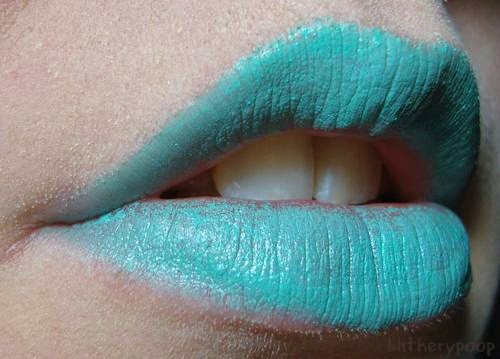 Colors like this used to feel so dry and heavy, but this is incredibly comfortable on the lips. I am so impressed! The only negative thing I can say is that they don't stay on the inner curve of the lips well at all. You can see what I mean in the photo below. I blotted, I begged, but nothing kept it from transferring onto my teeth and vanishing completely. 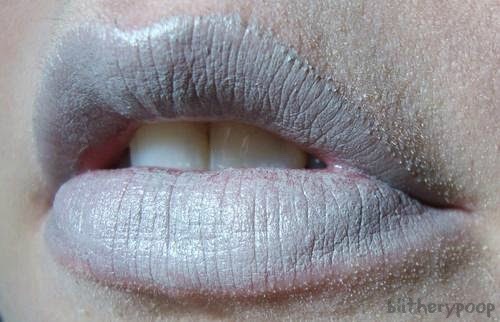 Lipliner would probably help fix this. I look really yellow in these two photos, but this is the best my camera could do. It was me or the lipstick. My phone did a better job (pj's and messy hair warning) catching the color. It's outstanding! The Beard, who was speechless (the bad kind) when he saw Pistachio, looked at this and pronounced it "so BLUE!" Indeed! I need to work up the nerve to actually wear Blue Velvet. I think if you have enough...chutzpah...and look put-together enough, you can get away with almost anything. I hope I'm right. 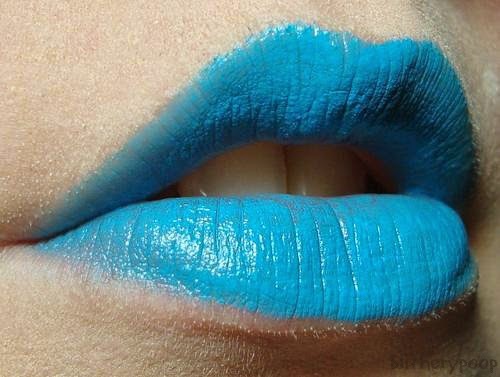 As amazing as the color...and I feel like a broken record here...is the feel on the lips. The non-pastel shades are creamy, smooth, and just perfect! Exclamation marks!! They're deserved!! 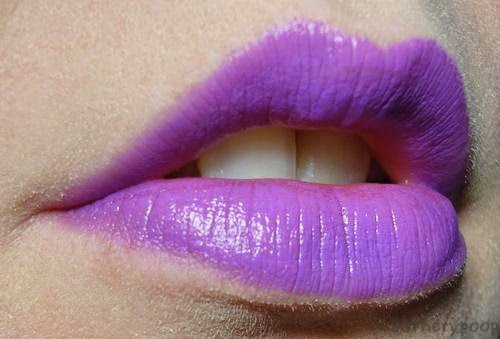 If you're just testing the waters of bolder, brighter lips, Violet would be the perfect gateway shade. The Beard (who was very tired of my shenanigans after a while) approved and said it looked good. It's got the same great feel and is 100% wearable in public. 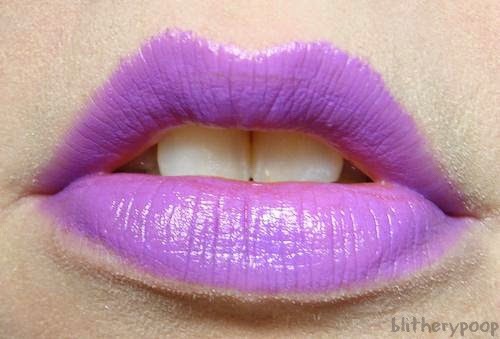 Purpley lips were huge last fall and the trend seems to be sticking around. Violet is right on time too since it's about as close to Pantone's 2014 Color Of The Year, Radiant Orchid, as anything I've seen. 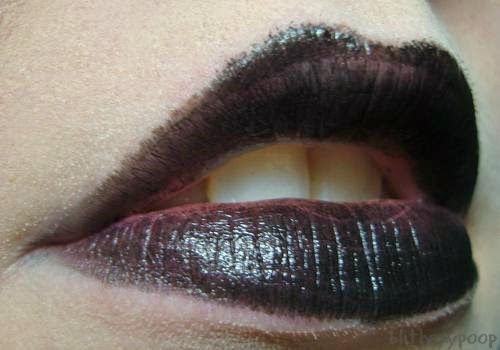 I always forget just how much I love black lipstick until I wear it again. It's so good to have one that actually feels good and doesn't smell like crayons. It looks a little patchy in my photos, but it looked immaculate in person. 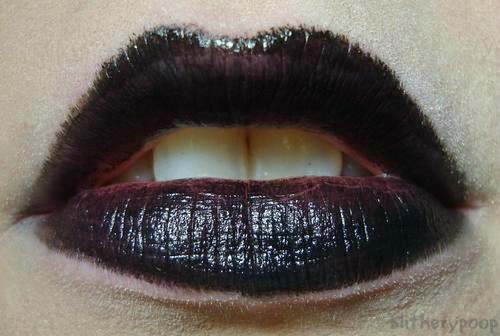 I think I need to demote Rimmel Black Diva from its place as my favorite black lipcolor. Chambord blows it away. I know I've used the word "impressed" too much already, but...I AM!! Bottom line: All five feel good on the lips, but the non-pastel shades are noticeably smoother. Of these five, Violet is the only one I'd call an everyday color...but that's the point, isn't it? They're aggressively not ordinary colors. They're bold, eye-catching, and yes...weird. I love them for it! -update- I forgot to mention, Blue Velvet and Violet both stained my lips. Blue Velvet left a slight blueness and Violet stained pink. It faded pretty quickly and might not show up on darker lips. Mine are very pale pink. Have you gotten any of these yet? If they ever come to Ulta or CVS, I may need to get a couple more. If you're eyeing them, they're $6 each on the NYX site, but Nouveau Cheap has details on how to bring that price down a bit. You know you need them! I wNt them so bad! Mostly the purple and the blue. My fav!